Hey! I’ll bet you’re all wondering how our visit to a casino in Goa on 12-12-12 went down, aren’t you? A good time was had by all…but first, pants had to be purchased. We arrived at the casino only to be turned away because they had a dress code. JB, Sanjiv, and Scott were in shorts. So were several other guys who showed up after us. I watched carefully as one man appeared to be in shorts was allowed in. The manager’s response? His shorts are below the knee! Sanjiv and JB left Scott and I sitting in the lobby while they went across the street to buy some pants at the open air market. Each pair cost five bucks and Scott was stylin’ in multicolor purple horizontal stripes. Sanjiv’s were brown and yellow track suit type knit pants and JB found below-the-knee shorts in blue and white stripe. We should have taken a photo but they didn’t allow cameras in the casino. Once inside we migrated towards the roulette table. The wheel was electronic and that proved disappointing for Scott. His lucky numbers did not come up but once. It was great fun all the same. Scott has a miniature roulette wheel that actually works. 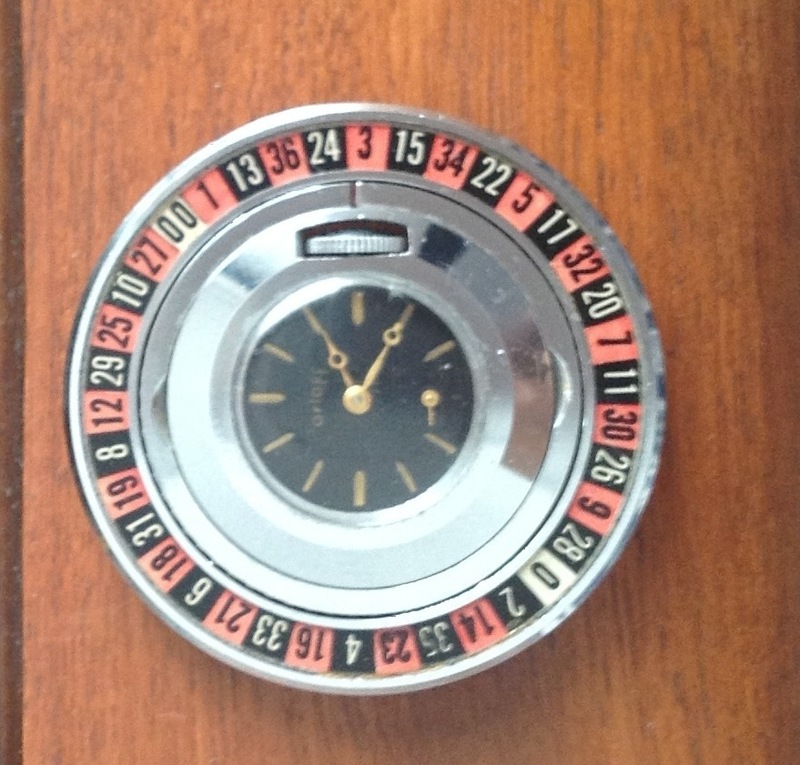 It is shown here in the photo above, is 2″ in diameter, fits in a pocket, and has another game on the reverse side. When we were traveling northern India a few weeks ago Scott would whip it out to entertain Sunil, the driver. We had a marvelous time on that portion of our trip and you might want to go into this blog’s archives to read the backposts. This entry was posted in Uncategorized and tagged Casino in Goa, Going to Goa Blog, Katy Allgeyer, Scott Morgan, traveling india. Bookmark the permalink. At least the guys scored some awesome pants…….hugs to all!